Israeli occupation forces (IOF) raided the village of Burqin, Jenin province, on Sunday and combed its streets firing teargas at young men who threw stones at the invading soldiers. Local sources said that the soldiers barged into the town’s center and broke into many homes searching for wanted Palestinians but none of them was arrested. They said that the soldiers arrested 15-year-old Hani Ghanim in the confrontations, noting that the soldiers opened heavy fire during the incursion. 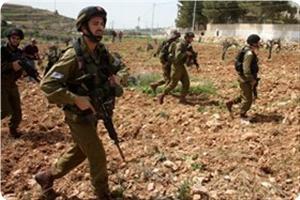 Other IOF units were deployed in the nearby Wadi Burqin and set up ambushes and combed the area. Israeli occupation forces (IOF) prevented Palestinian farmers from accessing their land in north and east of Al-Khalil on Saturday, local sources said. The popular committee in Beit Ummar village, north of Al-Khalil, told the PIC in a message that IOF soldiers denied Ali Awad his right to farm his land at the outskirts of Karmi Tzur settlement at the pretext of protecting security of settlers. IOF soldiers had destroyed olive, almond, and grape trees in the area to force the Palestinian inhabitants to desert their land. 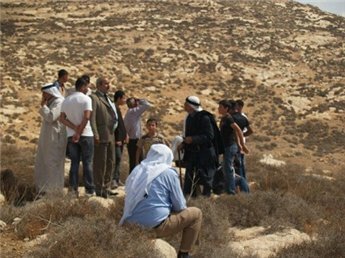 Citizens in Yatta town, east of Al-Khalil, said an IOF force refused to allow Palestinian farmers to tend to their land near to Susiya settlement. They said that the soldiers expelled the farmers from their land and declared the area a closed military zone. Saturday morning February 9; Israeli soldiers invaded and dismantled the Canaan protest village, east of Yatta town, near Hebron, that was installed by local nonviolent activists on Palestinian lands that Israel illegally confiscated for its settlement construction and expansion activities. The soldiers declared the area a closed military zone after surrounding it, proceeded to attack the residents, and removed their tents. Younis Araar, coordinator of the Nonviolent Committee Against the Wall and Settlements in the southern part of the West Bank, reported that dozens of soldiers attacked nearly 30 nonviolent activists who installed tents in the area located between Al-Baraka and At-Tawana area, and dismantled the protest village. Similar to Bab Al-Karama tent village (Gate Of Dignity), that was installed last month by Palestinian activists on privately-owned Palestinian lands in Beit Iksa village, northwest of Jerusalem, and Bab Al-Shams Palestinian village, near the Az-Zayyim village, east of occupied East Jerusalem, Canaan village was installed to protest Israel’s illegal confiscation of Palestinian lands for the construction of settlements as part of the so-called E1 Israeli settlement project.. The soldiers invaded the Bab Al-Karama on Monday at dawn - January 21, used excessive force against the nonviolent peace activists, and demolished the protest village. On January 15, Thousands of Israeli soldiers and policemen attacked the Bab Al-Shams Palestinian village, installed east of in occupied East Jerusalem, and forcibly removed dozens of activists loading them onto buses. At least 11 nonviolent peace activists, and 7 reporters, have been injured when the soldiers attacked a group of activists trying to reach the Bab Al-Shams. Last week, Israeli soldiers used force in removing another Palestinian protest village that was installed on Palestinian lands in Burin, in the northern part of the occupied West Bank. 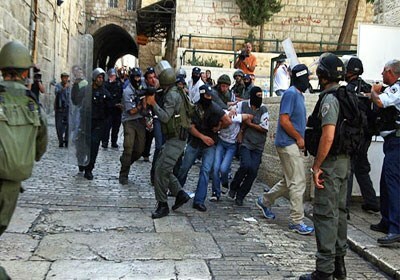 Violent confrontations took place on Friday between Israeli occupation forces and inhabitants of various areas of occupied Jerusalem that inflicted casualties in lines of civilians. In Silwan south of the Old City, a cameraman was hit with a rubber bullet in his foot while a number of citizens were treated for breathing problems after the IOF soldiers used rubber bullets and teargas canisters to quell the demonstration held in solidarity with Palestinian detainees on hunger strike. A nine-year-old boy was hit with a rubber bullet in the head in Issawiye village, to the north east of Jerusalem, and his condition was described as moderate. The village had witnessed clashes between inhabitants and the occupation soldiers after they destroyed a tent pitched in solidarity with hunger striker Samer Al-Issawi for the 20th time. Another youth was also hit with a rubber bullet in the head during those confrontations. IOF soldiers arrested three young men. Fierce confrontations were also reported in the vicinity of Qalandia military roadblock and at the entrance to Ram village to the north of occupied Jerusalem in which soldiers used rubber bullets, stun grenades and teargas canisters against the demonstrators. A young man was hit with a stun grenade while three others were injured with rubber bullets. Clashes took place at the entrance to Shufat refugee camp after which the soldiers raided the camp in big numbers and five youths were treated for gas inhalation. Marches in Alezariye and Abu Dis were organized in solidarity with hunger striking prisoners that ended with similar confrontations and the injury of three men with rubber bullets. A peaceful march proceeded from the Aqsa mosque to Bab Al-Wad street in the Old City and raised slogans demanding freedom for the hunger striking prisoners. Israeli occupation forces (IOF) suppressed the West Bank's peaceful weekly anti-apartheid wall and settlements marches, launched this week under the slogan of solidarity with the hunger striking prisoners in Israeli jails. A number of participants in the weekly march of the village of Ma'sara in the south of Bethlehem, on Friday afternoon, suffered suffocation as the IOF fired tear gas grenades at them during the clashes that broke out in the village. The Israeli soldiers set up a checkpoint at the western entrance to the Ma'sara village, attacked the demonstrators and prevented them from reaching their confiscated agricultural lands. 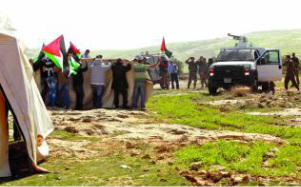 Scores of citizens and foreign solidarity activists, who participated in the weekly march of Bil'in village, suffered breathing difficulty as the occupation forces suppressed the march. The occupation soldiers fired rubber-coated metal bullets, stun grenades and gas at the demonstrators upon their arrival to Abu Lemon Reserve, adjacent to the apartheid wall. Israeli troops also attacked the participants in Kafr Qaddoum's weekly anti-settlement march, launched to protest at the closure of the village's main road, which led to wounding three citizens and caused dozens of others to suffer breathing problems. 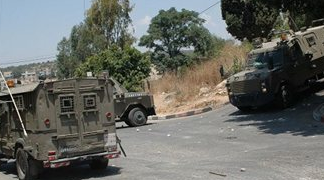 The Popular Resistance Movement in the village of Nabi Saleh said in a statement that the IOF attacked a number of citizens and foreign peace activists participating in the weekly march of the village that was launched from the Shouhada Square in protest at the settlement activity and the confiscation of land. Meanwhile, IOF quelled the march, organized by residents of the area of Harayik at the southern entrance to the city of al-Khalil in the southern West Bank. 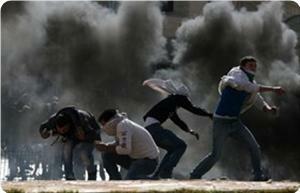 Clashes erupted in the area and a number of citizens suffered suffocation, eyewitnesses told PIC. The force would enter the village in all hours of the day and night, sound sirens, horns and loudspeakers, and use stun grenades and light flares – for no reason, Yedioth Ahronoth reported. According to the paper, Yesh Din organization sent a letter to Military Advocate General Danny Efroni in which it warned that there are suspicions that the soldiers committed acts that are illegal according to army protocol. The organization demanded that Efroni order an immediate criminal investigation into the events, which raise suspicions of abuse and overstepping authority. Israeli military sources issued a statement saying that over the past few months, the army activity in the area has been bolstered following an increase in disturbance incidents, in order to minimize the clashes between the resident of Urif and Yitzhar settlement. Video depicting troops intentionally disturbing peace of Nablus-adjacent village surfaces online. 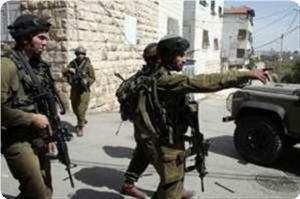 IDF: Soldiers reprimanded. Israeli soldiers invaded, on Thursday afternoon, the schools area in the village of Ya’bod, south of the northern West Bank city of Jenin, clashed with dozens of school students, and fired round of live ammunition, gas bombs and rubber-coated metal bullets. Injuries were reported. Eyewitnesses reported that at least 10 students have been treated for the effects of teargas inhalation after the soldiers fired dozens of gas bombs into school yards in the area. The attack led to clashes between dozens of students and the invading Israeli soldiers; the students hurled stones and empty bottles at the soldiers who fired rounds of live ammunition, gas bombs and rubber-coated metal bullets. Furthermore, eyewitnesses reported that the army installed a roadblock at the eastern entrance of the village, stopped and harassed dozens of residents. 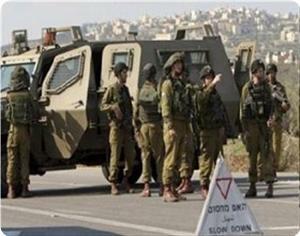 The soldiers installed the roadblocks after a number of extremist Israeli settlers invaded Al-Hafeera area in the city. In related news, the army kidnapped one Palestinian youth, identified as Sameh Jamal Al-Qitt, 19, after the soldiers invaded an area close to the Salem Israeli military base, north of Jenin city. The youth was cuffed and blindfolded before being taken to an unknown destination. He is a resident of the Eastern Neighborhood in Jenin. In Ramallah, Israeli military sources claimed that two Israeli soldiers have been mildly inured during clashes that took place between the soldiers and the residents after the army invaded Budrus village, west of the city. The army invaded the village through the western gate of the Annexation Wall, and harassed dozens of residents leading to clashes. The village witnesses repeated invasion due to its nonviolent activities against the Annexation Wall and settlements. Israeli occupation forces demolished a protest tent set up in solidarity with hunger striking captives in Israeli jails, in the village of Isawiya north of Jerusalem on Thursday evening. Local sources said that the Israeli forces have raided the area of al-Khaimah in the center of the town and have demolished, for the 19th time, the tent, confiscated its contents, and banned the presence of the activists there. 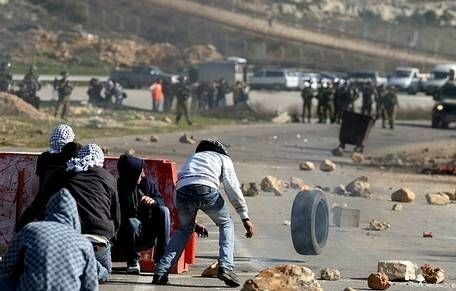 The sources added that the Palestinian youths confronted the Israeli occupation force through throwing stones and empty bottles, which caused the outbreak of violent clashes. 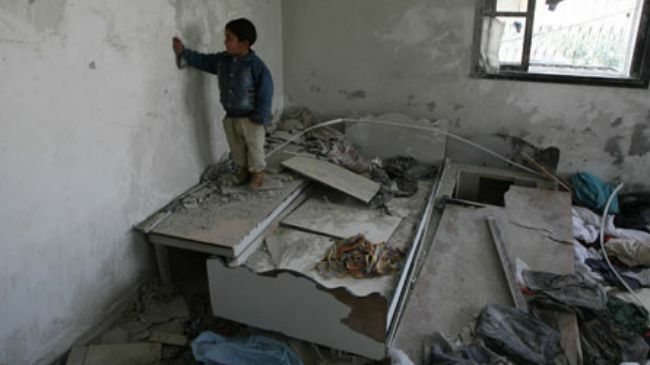 Israeli occupation forces (IOF) raided the Beit Ola village’s municipality at dawn Thursday and wreaked havoc on it. A responsible source in the municipality, south west of Al-Khalil, said that the soldiers blasted their way into the premises. He said that the soldiers destroyed all external and internal doors before ransacking it and destroying its furniture in the process. Israeli occupation forces (IOF) manning the Hamra roadblock in the northern Jordan Valley arrested a Palestinian young man at dawn Thursday. Local sources said that the soldiers detained Suleiman Mohammed, 19, at the roadblock while heading from his hometown of Tobas to his work in the Jordan Valley. Other IOF soldiers stormed Erka village to the west of Jenin at dawn Thursday and questioned citizens who were going for dawn prayers. IOF soldiers had burst into an elementary school west of Ramallah on Wednesday and threatened to beat students and teachers and called them bad names, Palestinian sources said. Palestinian medical sources reported that a Palestinian shepherd was attacked, on Wednesday afternoon, by a group of extremist Israeli settlers west of the northern West Bank city of Nablus. The Maan News Agency reported that Khaled Mahmoud Barry, 42, from Amateen village, suffered various cuts and bruises. Israeli occupation forces (IOF) stormed at dawn Wednesday Tobas city and nearby Fara’a valley and performed military exercises and combed both areas. Eyewitnesses said that IOF performed military drills in the valley after a landing operation using helicopter gunships and fired flare bombs in the process. IOF soldiers also stormed Faqu’a village, east of Jenin, and combed its alleys and streets before stationing in the vicinity of the village’s main mosque. IOF troops on Tuesday afternoon broke into the village of Orif, south of Nablus, and attacked the village’s secondary school, locals said, adding that the soldiers ordered the headmaster to evacuate the school immediately and to turn himself in. Eyewitnesses said that the soldiers used violent means in storming the village, recalling that they had frequently attacked the village earlier this week firing teargas canisters, stun grenades, and rubber bullets at citizens. 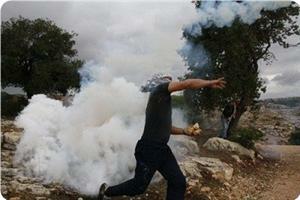 They said that dozens of the village inhabitants were treated for gas suffocation including a month old baby girl. The general union of Palestinian workers syndicates held the Israeli occupation authorities (IOA) fully responsible for the life of 92-year-old woman Amna al-Hithnawi. 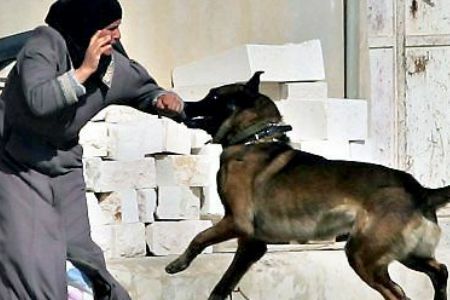 The union said in a press release on Wednesday that the Israeli occupation forces (IOF) had unleashed their dogs at inhabitants in Jenin and one of them attacked the old lady. It said that due to the negligence of IOF soldiers one of the dogs fiercely attacked the old woman that almost lost her life in the incident. The union asked all international human rights groups to probe the IOA practices that ran contrary to all humanitarian rules and norms. Hithnawi is still suffering from the attack that occurred almost a month ago in the industrial area in Jenin. Israeli occupation forces (IOF) escorted military bulldozers into eastern and southern Gaza Strip areas at dawn Tuesday and leveled land near the border fence. Eyewitnesses told the PIC reporter that five IOF bulldozers advanced 200 meters from the eastern borders toward Juhr Al-Deek area and leveled land lots. They said that the bulldozers removed weeds and growing wild plants, noting that it was the second such act in the area. 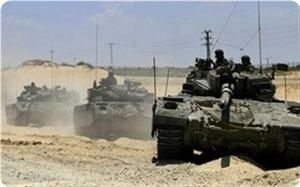 IOF soldiers in tanks and armored vehicles escorted bulldozers further south to the east of Rafah city. Locals said the soldiers opened fire at farmers to force them abandon their land lots before starting to bulldoze the land in the proximity of the border fence. IOF soldiers have raided border areas in Gaza on numerous occasions after the calm agreement was signed in late November last year. Indiscriminate shooting during those incursions led to many casualties among local inhabitants. Palestinian medical sources reported, on Monday evening, that one youth was moderately injured after being rammed by an Israeli military jeep in Za’atara village, south of the West Bank city of Bethlehem. The young man, identified as Khalifa Mohammad Mahameed, 23, suffered several fractures and bruises to various parts of his body. 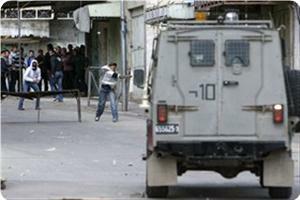 He was moved by a Palestinian ambulance to the Arab Society Hospital and Rehabilitation Center, in Bethlehem. There have been numerous similar incidents, sometimes leading to fatalities and very serious injuries, including hit and run incidents caused by Jewish settlers in the occupied West Bank, including in occupied East Jerusalem. A month earlier, another child was seriously injured after being hit by a settlers’ vehicle as she was walking home from school in Tiqoua’ village, near the West Bank city of Bethlehem. Young men in Bustan suburb in Silwan town, south of occupied Jerusalem, engaged Israeli occupation forces that stormed their homes on Sunday night. Fakhri Abu Diyab, the head of the committee in defense of Silwan land, said that hundreds of Israeli soldiers broke into citizens’ homes and arrested many civilians under various pretexts. He said that the citizens were taken to police stations for questioning, adding that the Israeli police forces set up roadblocks in Silwan and stopped and searched cars and passengers. National Bureau for the Defense of Land said in its weekly report that the Israeli occupation authorities are still continuing the policy of ethnic cleansing in Jerusalem and the Jordan Valley. The report pointed out that the occupation authorities are seeking through the demolition of Palestinian properties to take full control of the lands in these areas. It said that the occupation authorities have announced its intention to demolish houses in the district of al-Fahidat in the east of the town of Anata, northeast of Jerusalem, for its proximity to an Israeli training camp. The forces handed over, to the residents, notifications to demolish thirteen houses and ten tin huts, within a scheme aimed to Judaize the city of Jerusalem. The occupation authorities have also notified the demolition of houses inhabited by more than 150 people near the village of Jaba east of Jerusalem. The National Bureau for the Defense of the Land pointed that the settlement regional Council has approved the building of a cultural village on an area of ​​218 dunums of Anata village lands, northeast of Jerusalem. For its part; the Israeli District Committee for Planning and Building has also approved the settlement scheme in Buraq Square, in order to continue the archaeological excavations aimed to steal and falsify the history of ancient monuments. The occupation authorities have notified a number of citizens in the town of Zubaydat, in the Northern Jordan Valley, to evacuate their homes before 10 February. 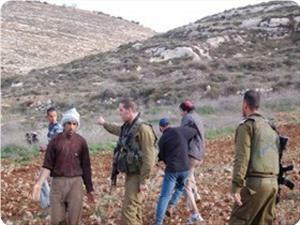 In al-Khalil, the IOF prevented dozens of farmers and international and Jewish activists from arriving to fields in the east of the town of Yatta and declared the area a closed military zone, in an attempt to seize it. The Israeli army conducted military exercises in lands of Palestinian villages, in violation of the Israeli Supreme Court decision that prevents conducting training in those areas. The occupation authorities have also started building an outpost in Jayyus lands located behind the Apartheid Wall. Meanwhile, the settlers continued their attacks on the area of Khallet al Fahm in Khader village in Bethlehem, as they uprooted more than 800 olive trees in the area in preparation for the establishment of a new outpost that may be added to the settlements of Gush Etzion and Efrat. Jewish settlers attacked a number of citizens driving their vehicles on the main road connecting Jenin and Nablus, near an evacuated settlement from which the Israeli forces had withdrawn after the Israeli withdrawal from the Gaza Strip. Israeli Occupation Forces (IOF) launched on Sunday afternoon raid campaigns against Palestinian houses and shops in the city of Jenin and set up ambushes on the streets. Eyewitnesses said that dozens of Israeli soldiers raided the home of Dr. Ashraf Jarar and tampered with its contents, as soldiers raided a number of neighboring houses. The Israeli occupation forces stormed in the industrial area and raided repair workshops and the home of Samir al-Ardah and questioned those residing in it. The citizens stated that Israeli soldiers raided the schools' street in the city of Jenin as an attempt to provoke the students during their presence in the area. According to local sources, the Israeli occupation forces closed the eastern entrance to Jenin and began deploying between the houses before withdrawing. Meanwhile, Occupation forces raided on Sunday a number of neighborhoods and towns in al-Khalil governorate south of the occupied West Bank, while setting up a number of military checkpoints. Eyewitnesses reported that Israeli patrols raided at dawn a number of neighborhoods of the city of al-Khalil, and established a number of surprise military checkpoints. Israeli forces also raided the towns of Bani Naim, Dora, al-Sur, Yatta and Samu, while setting up a number of military checkpoints on main junctions. The Israeli occupation forces (IOF) violently suppressed the peaceful marches that were held in different West Bank villages on Friday against the segregation wall and the settlement expansion. 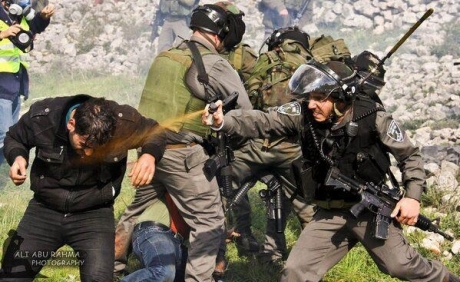 In Kafr Qaddum village east of Qalqiliya, the IOF detained one protestor and caused tear gas injuries to many citizens, including seven children. Eyewitnesses reported that the Israeli troops fired tear gas heavily at the Palestinian and foreign protestors in the march, and a large number of canisters fell in the house of Dawoud Ishteiwi, wounding seven of his children. The Kafr Qaddum villagers organize their march every Friday to demand the Israeli army to open the main road of their village that has been closed for more than 10 years. The IOF also suppressed the weekly march of Masarah village, south of Bethlehem, which protest the building of the segregation wall on Palestinian lands. 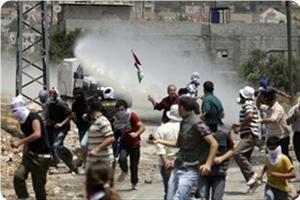 The troops prevented the protestors from reaching their lands south of Bethlehem and physically assaulted them. Dozens of Palestinians and foreign activists also suffered suffocation during a tear gas attack on the Bil'in march against the wall and settlement. 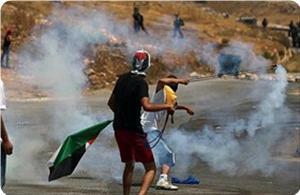 Protestors in Bil'in village said that the IOF also used rubber bullets, stun grenades and wastewater against them. The IOF also used excessive violence against the protestors in the weekly marches that were held yesterday in Ni'lin and Nabi Saleh villages. In Yatta town south of Al-Khalil, the IOF kidnapped at dawn Friday Mufdi Rabei, an anti-wall activist in the town, from his home and took him in chain to Etzion detention center. Israeli soldiers have shot and injured two Palestinian teenagers in northern Gaza Strip, in another violation of a truce signed in November 2012. Gaza Health Ministry spokesman Ashraf Al-Qudra said both teenagers were shot in the leg on Friday as they were walking towards a security fence in the northern town of Jabaliya. 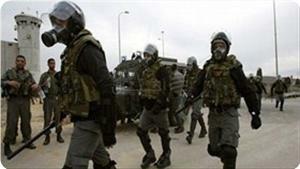 The injured Palestinians were taken to a hospital in Beit Lahiya for treatment, the ministry spokesman added. Friday’s shooting brings to 51 the total number of Palestinians injured since the 2012 truce. At least four Palestinians have also been killed since then. On Tuesday, a Palestinian teenager was injured by Israeli soldiers near the city of Beit Hanoun in northern Gaza Strip. The victim was reportedly collecting old metal scraps when he came under Israeli gunfire. The November ceasefire came into effect following an eight-day Israeli offensive that killed more than 170 Palestinians in the besieged Gaza Strip. Under the truce agreement, Israel is required to allow Palestinians to enter what it had previously declared as a 300-meter deep no-go zone on the Gaza side of the border. Farmers have been allowed to move up to 100 meters from the border, but Israeli troops open fire at the Palestinians they claim have gone further than that. For the second day in a row, Israeli soldiers and policemen continued their campaign in Silwan town, in occupied East Jerusalem. The army broke into homes and stores, and kidnapped a number of residents. Soldiers, policemen, and personnel of the tax department in the city, started their campaign on Thursday morning, and installed several roadblocks at the entrances the neighborhoods of Be’er Ayyoub, Wadi Al-Rababa, Ein Al-Lowza, Al-Bustan, Ath-Thoury, Al-Abbasiyya, Wadi Hilweh, and Al-Ein. They searched dozens of vehicles causing huge traffic jams, especially in the morning hours and at noon. Policemen also ticketed dozens of drivers after searching their cars and inspecting them, while personnel of the revenue department inspected their files. On Thursday evening, the army kidnapped three Palestinian youths in Silwan, including one who carried a West Bank ID card. They were kidnapped at the military roadblock in Wadi Al-Rababa. The two have been identified as Sa’id Al-Tawil and Shihab Abu Rmeila. Jawad Siyam, head of the Wadi Hilweh Information Center in Silwan reported that a similar campaign was carried out for a month in the Al-Esawiyya town, in East Jerusalem, adding that the army kidnapped dozens of residents, including women and children; four residents are still imprisoned. Siyam stated that the arrests are arbitrary, without any cause or warrant, and that the army also broke into dozens of stores and homes, and repeatedly shutoff water pipes leaving the town without water. Siyam also stated that the ongoing attacks are acts of collective punishment practiced against the residents, and that there is an Israeli special task force that repeatedly invades and attacks Jerusalem villages and towns that protest the ongoing Israeli settlement activities, the illegal confiscation of Palestinian lands and the ongoing arrests. 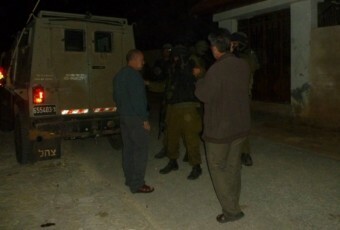 On Thursday evening, Israeli soldiers kidnapped two Palestinians in Silwan and took them to a nearby detention center. The two have been identified as Sa’id Tawil and Shihab Abu Rmeila. In related news, the District Court in Jerusalem extended remand of several Palestinians, including a number of children. 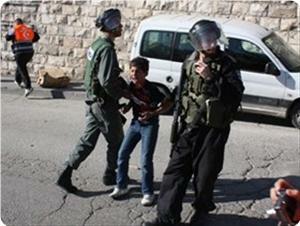 Dozens of youths and children were kidnapped last month during repeated invasions and attacks carried out by the police in Silwan.